Pretty Little Liars - Out, Damned Spot - Review: "The Mystery of Mike Montgomery"
5.19 - "Out, Damned Spot"
The girls are surprised Hanna got into lots of colleges. Johnny tells Spencer she doesn't have to go to college. Mike gets defensive with Mona's friend and angrily tells her to give him the book she took out of her room. Ezra thinks it's a good idea he and Aria have some space. Emily and Talia kiss. Ted asks Ashley to marry him. Hanna asks Ashley if she told Ted about Jason but she hadn't. Johnny built a secret whisperer machine in the Brew. The girls conclude Alison is having outside help from someone they would never suspect and we see Mike sign in at the prison to see her, even after Aria told him not to. At the Blood Drive, the girls are getting their bloods taken. Emily can't get hers taken as she was in Haiti over the summer and Spencer takes her cookie off her. Bad Spencer, but she didn't make the rules so I guess she's right. Turns out the event is Ashley's idea and Hanna got them to go as the church folk Ashley invited cancelled last minute - guess we all know why. Ashley gives Emily a brownie which Aria takes away from her. I know Emily didn't give blood but I'm starting to feel sorry for her here. Someone from the church does show up and Ashley goes to greet her. The woman won't give blood and she says the others have missed Ashley the past few weeks and tries to get the gossip on why Ted has been distracted. She's a pretty rude old lady. She asks Ashley to ask Ted to put some flyers up around the church and Ashley agrees. Mike then distracts everybody by knocking things over and acts sketchy. He leaves, and we see the case with the blood vials open. At the school, the girls discuss Mike and what he was doing at the blood drive. 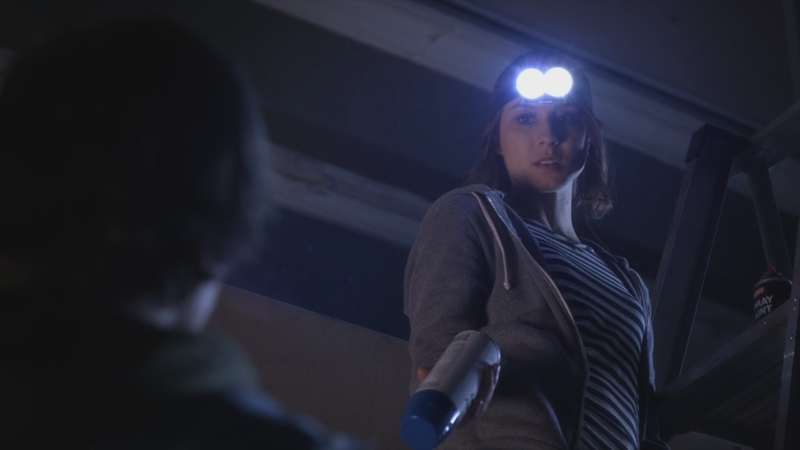 Spencer thinks he was trying to steal their blood to help Alison which is exactly what I think too, and Hanna. Great minds think alike girls. Aria goes to her maths test and begins copying off Andrew (haven't seen him in a while) in the class. I would condemn Aria for this but to be fair, Andrew might as well have shouted the answers out the way he held his paper up. It was like he wanted people to copy off him. We cut to Hanna asking Spencer about college and financial aid. Thank God for student finance where I live because being at University is expensive! Hanna reveals Ashley left working for the DiLaurentis's so Hanna needs help. Spencer flicks through her letter and reveals they think her father can pay for it. 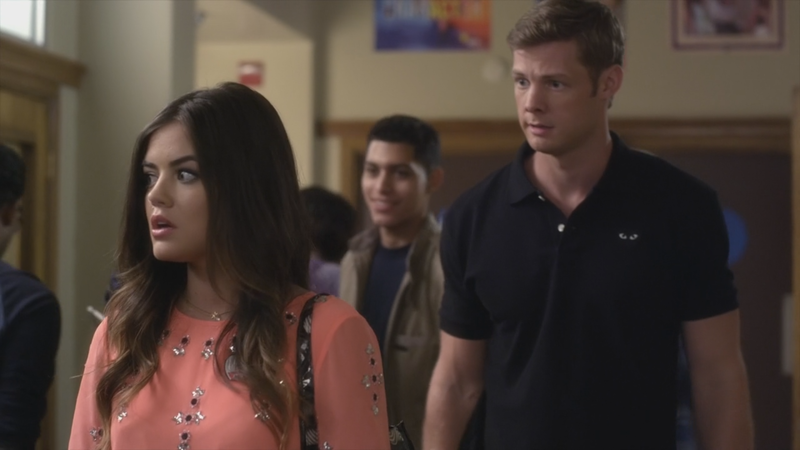 Aria leaves the classroom when Andrew approaches her. Apparently he saw Aria copy off Andrew (does he have eyes on the back of his head because Aria would have seen him look and would have stopped) but he isn't mad. He offers to tutor Aria and at first she declines but she eventually accepts. Emily and Talia are riding their bikes as they stop. Talia takes Emily to where she had her first kiss (with a boy, much like Emily). Talia tells Emily about how he had frog cheeks and burped to ruin the moment. Talia asks what Emily's biggest fear is, which I find a little odd in this show when the girls' fears are always coming true. Emily, being the smart girl that she is, doesn't answer it and instead plants a kiss on Talia's lips. Way to go Emily! The do-over Talia needed. Bless. Ashley is in her kitchen looking at her ring when Hanna walks in. Ashley reveals she went to see Ted after the blood drive as he deserved an answer - she said she wanted to marry him but then she told him about Jason. Ted told Ashley he needs to think and would give her a call in a few hours but he couldn't even look at her. Mike: From a Rugrat to Being All Grown Up! Cut to Aria and Spencer on the phone to each other. Aria rightfully brings up the point about how Spencer thought Melissa was A for a while and was wrong. Aria promises to watch Mike if Spencer promises not to jump to conclusions. That's going to be a promise unfulfilled considering jumping to conclusions is the foundation of this show. Johnny soon appears out of nowhere which is getting a little creepy now and he has exclusive access to their fridge. He asks about Toby which is really sketchy considering he seems to flinch around him knowing he's a "cop". Johnny wants her to attend something with him but she has to e-mail family associates to get into college. We go back to Aria and we hear a phone ring. It's not hers, it's Mike with the Caller I.D. blocked. She picks it up and it turns out to be a call from the correctional facility Alison is at. It says it's from an inmate called Hank Mahoney but the voice is clearly Alison's. When Aria accepts, Alison puts the phone down. Spencer is helping Johnny with the mural. He reveals he just broke up with his girlfriend and has a tendency for getting with unavailable women - emotionally or otherwise - which has me thinking he's trying to get into Spencer's pants. They talk about Spencer's ambitions for a bit. Cut back to Aria's house where Mike is lifting weights. Hot damn boy. Here's me eating pizza and there's him looking god-damn beautiful! Aria grills him with questions but Mike isn't so forthcoming. Mike closes the door in Aria's face and I can continue to eat my junk food now. Hanna is on the phone to Caleb when Ashley comes in and tells Hanna her father can't make lunch the next day. Hanna tells Ashley why she can't get financial aid and Ashley tells her that going to her father will not fix it but she will. At the Brew, Ezra is there when Emily comes in. Ezra notices she and Talia are getting along better. 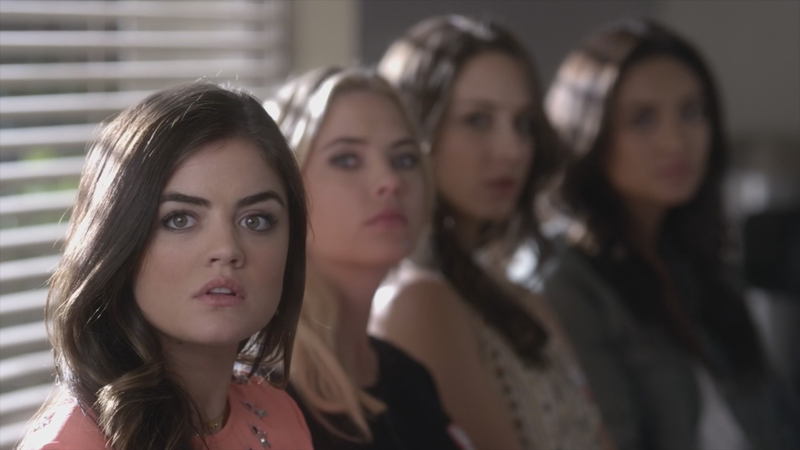 Emily changes the subject to Aria and reveals something Ezra didn't know about her getting into another college. Emily notices Talia's last name is different on a file Ezra has and it's revealed she's married to a man. Shock horror! Back with Spencer and Johnny, Spencer has a look at the mural and she loves it. Johnny wants her to add some of her own art but she's worried she'll ruin it. She almost falls off the ladder and Johnny catches her. Pretty romantic. Back with Mike, he's on an instant messenger service talking to Hank Mahoney. He says "She told me what to bring. I'll have it tomorrow. What time?" and Hank replies "I'll be in touch." Mike goes to his fridge where, inside a can of Power Mass, is a vial of blood. But whose? The next day, Spencer confronts Johnny in the garden as it turns out they vandalised the college last night. I knew something was off when it was nighttime and the fact that Johnny was being pretty sneaky about it. Spencer is made he tricked her into doing something illegal. Andrew and Aria are having their study session. Ezra's name comes up which is a little awkward. Aria gets distracted by a text from Hanna asking about Mike, and then another text from Hanna and Andrew cleverly uses it to make Aria use her brain. She's not doing this study thing very well. At the Brew, Talia is making something in the kitchen and wants Emily to try some but Emily refuses. She reveals she knows about Talia's husband and that she's married and leaves when Ezra comes in. 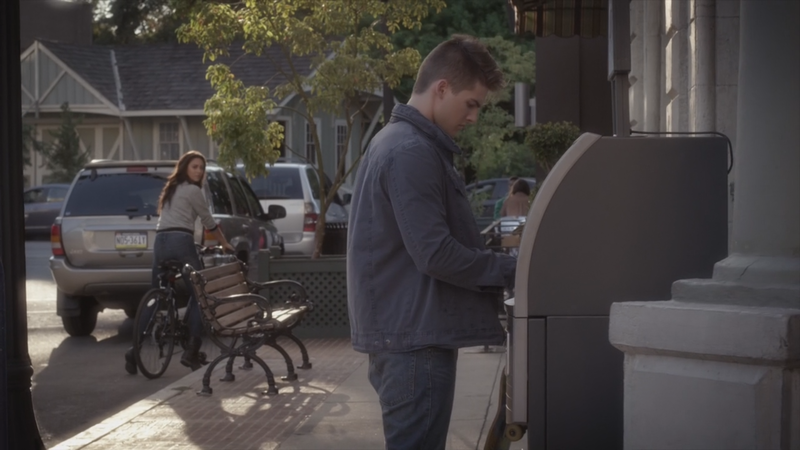 Emily rides her bike in the town and she notices Mike at the ATM. He pulls out a lot of money and leaves and Emily goes to the ATM where Mike's receipt has printed out. His balance is a massive $18,356.25. Wow. And he only withdrew $400. Back to Aria and Andrew who seem to actually be having a better study session than before. Emily interrupts, wanting to talk to Aria about Mike. 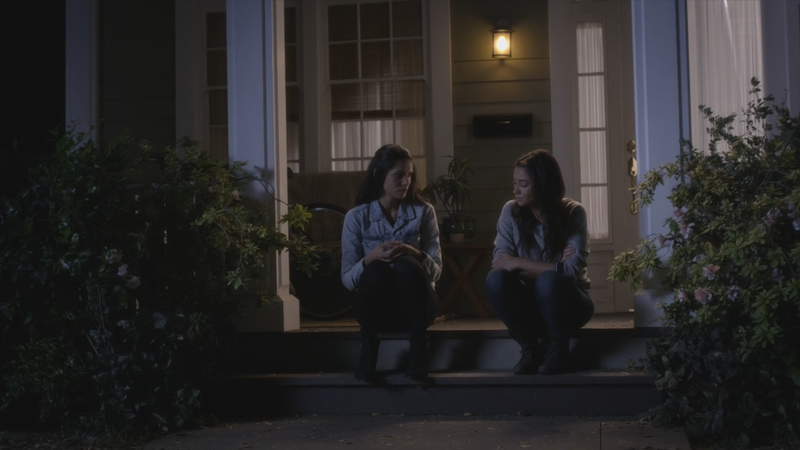 They go outside and Emily shows her the receipt, thinking it could be one of Alison's accounts. 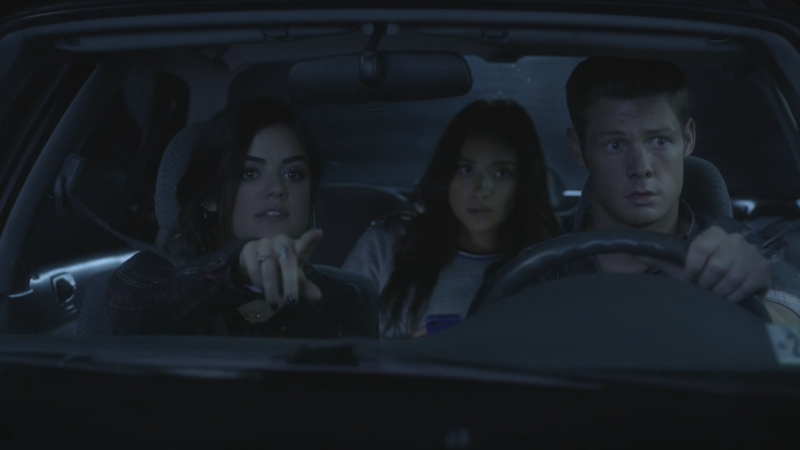 Aria tells Emily about Mike's phone call from Alison and they hear Mike start the car up. They decide to follow him and ask Andrew to borrow his car. Being the good guy he is, he asks if either know how to drive stick. Of course not. At Tom Marin's office, Hanna has visited her father. He's impressed she got into the colleges she got into and she wants to talk to him about the finance for it. Tom isn't so generous and only sticks by his agreement with Ashley for $10,000 a year. He reveals Kate is also going to private school and he can't afford to pay for both. This upsets Hanna, and rightly so. Tom never even asked where Hanna applied to and automatically promised to help Kate beforehand. Hanna storms away. How can he put a woman who isn't even his daughter before his own? Harsh. Spencer is on her laptop sending an e-mail to Melissa, asking if Wren still has that contact at Oxford. She sees the vandalism story on her laptop and smiles. Andrew is driving Aria and Emily who gets a text from Spencer saying she'll be there soon. Andrew asks questions about Mike and Emily thinks of a lie to cover up the truth - Mike is dabbling in drugs. It sounds like it could be true. They stop at their destination and let Andrew go. Bless him, missed most of his batting practice to do a good deed. Doesn't look like he's leaving though. Have I mentioned how much of a good guy he is? They've arrived at a Diner filled with older guys and see a man approach Mike. It's Hank, but Emily knows him to be Cyrus - Alison's fake kidnapper. Mike pulls out some money and they sit down to talk. Hanna arrives at the Brew asking Ezra where Emily is as she left her phone at her father's office. Ezra asks what's wrong and they sit down to talk. Hanna wanted her father to help pay for her school but even more than that - she wanted him to say he knew she could do it. Ezra tells her he paid for his own school after his parents cut him off. He helps Hanna feel better though, saying that when he was a teacher, he always knew she had it in her. So sweet. 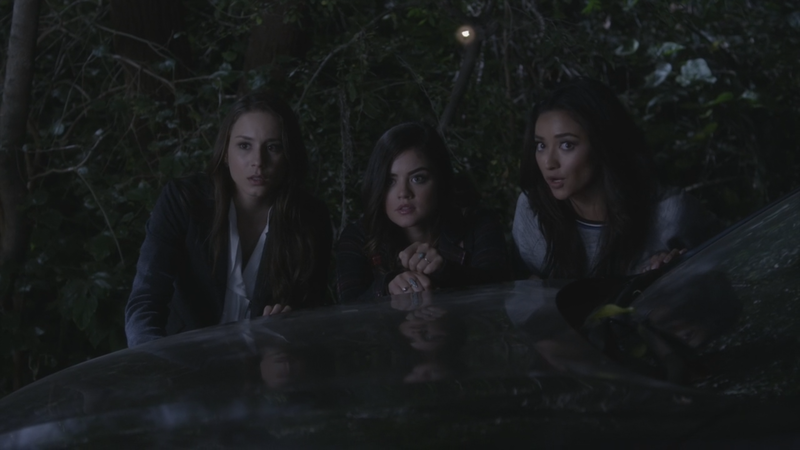 Spencer arrives at the Diner where they all hide behind her car to look at Mike and Cyrus. Aria doesn't care if Mike is working for Alison, she just doesn't want him getting hurt so she's about to burst in but the others stop her. Hanna tries to call Aria on Ezra's phone but Aria rejects it thinking it's Ezra. They discuss Aria's relationship with Ezra for a bit and Spencer makes a comment about Emily's love life before they all get a text. Finally, an A text. The first one this episode. It's a photo of Aria's, Spencer's and Hanna's blood vials with the message "Thanks for donating to my get-into-jail fund - A." As they look back up, Mike and Cyrus are gone. Mike drives away and the wonder where Cyrus is. He appears on a motorcycle and chases the girls to the dumpsters. They suggest a trade as he has something of theirs. Andrew - hero of the day - appears with a bat and tells him to back away. Cyrus drives off. I don't know if I wanted Andrew to save them here as that trade sounded promising. In the Marin household, Ashley gives Hanna her phone back after her father dropped it off. They talk and Hanna thinks of entering the beauty pageant as it has a $20,000 scholarship. Ted still hasn't called either and Ashley doesn't think he will. Hanna doesn't want her mother to give up on Ted and tells her to fight for him. Ashley agrees and goes away to phone him. Hanna sees her missed texts and calls on her phone from the others. Emily gets a text from Talia asking to talk. Emily replies but Talia is already there. At Spencer's, Aria and Spencer arrive to see Johnny filling up the freezer. Aria goes upstairs to allow Spencer and Johnny to talk. She isn't mad with him anymore as she had fun but she also has boundaries. Talia tells Emily about her marriage. She tells her she married Eric after dating since ninth grade and married right after high school. He knows about her attraction to women but they're each other's best friend. Talia didn't want to scare Emily away so she kept it secret. Emily tells her there are things she can't share as she'd be scared away but Emily moves her hand closer. Awww. Aria is sleeping over at Spencer's and Hanna is there too. Aria is a little scared of her brother now and they're worried about their blood vials. Spencer goes downstairs to get another blanket and we see Mike in the window watching her. Very creepy Mike. What are you doing?! We then get our final A scene - we hear the recorded conversation of Hanna and Caleb disposing of evidence while A picks up Hanna's blood vial. They drop a few drops of Hanna's blood on Mona's bloody shirt. First Aria cheats on her maths test. 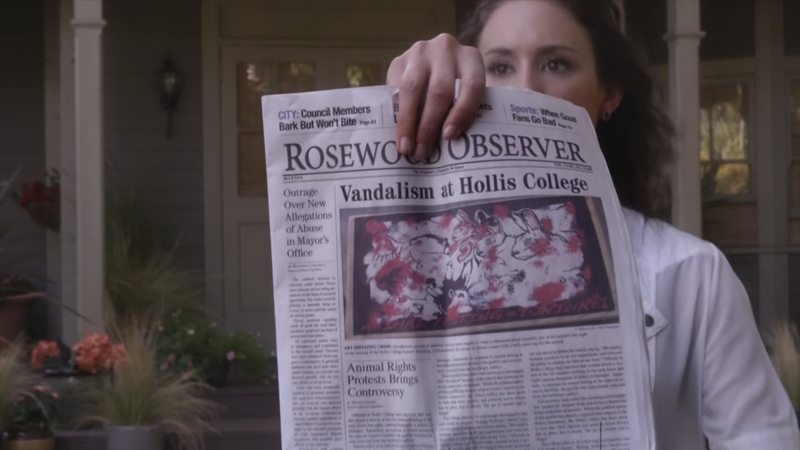 Then Spencer vandalises a college. It's an episode of the Liars breaking the rules! I thought maybe more would come from Aria's cheating on her maths test but I guess not, though it did score her Andrew. I still don't know how he saw Aria cheat when he was sitting in front and he would have had to turn and Aria would have saw that. We continue to see Ezra and Aria be distant with one another and the others are starting to realise it. Fortunately the Mike storyline saved Aria in this episode as she was growing too dull lately. It's a shame she can't trust her brother anymore and he's on the A-Team by helping steal those vials. Mike has turned full-on creepshow now as he ends the episode with watching Spencer through a window. I'm glad they made him interesting though. Emily and Talia hit a speedbump when things seemed to be going smoothly but fortunately that bump in the road turned out to be a minor one and they're reconciled. I do like Talia but I'm remaining wary of her character just in case. I did love Hanna's story in this episode, and I always love her scenes with Ashley. They make the best mother-daughter pairing. In fact they're the only constant mother-daughter pairing on the show anymore as we never see Ella or Pam anymore and Veronica made a rare appearance in the last episode. Anyway, I really hope Ashley fights for Ted. And Hanna's father is a douche. Picking Kate over his own flesh and blood is so low. At least it's going to drive Hanna into putting her all into paying for college herself. Spencer's time with Johnny seems a little dangerous to me, walking a fine line there. Toby was nowhere to be seen which is great, but I don't think Spencer spending time with Johnny is doing any good either, even though he's getting her to do more fun. I'm definitely wary of him. Great end scene too as we see the beginning of the frame-up of the girls. Everything is falling into A's favour. Still have six more episodes to go before finale so I'm expecting more dragging things out in the next few episodes but I'm hoping the pace will pick up soon. Kind of sick of these mediocre episodes that I could easily just skip. It wasn't a terrible episode but it was pretty uneventful too. Prettiest Little Liar: Emily Fields. The girls didn't do an awful lot in this episode so it was hard to pick, but Emily didn't cheat on a test or vandalise a college so her hands are the cleanest. Most Macho Male: Andrew. Knight in shining armour. Favourite Episode Pairing: Emily and Talia. Again. I like their progress and the little marriage reveal was a nice little bump even if it did get tossed aside with a convenient explanation. Best Line: "You just don't want to disappoint the wrong daughter, I get it." - Hanna Marin to her father. If you can call him that, sleezeball! Loved that Hanna stood up to her father though in her passive-aggressive way. 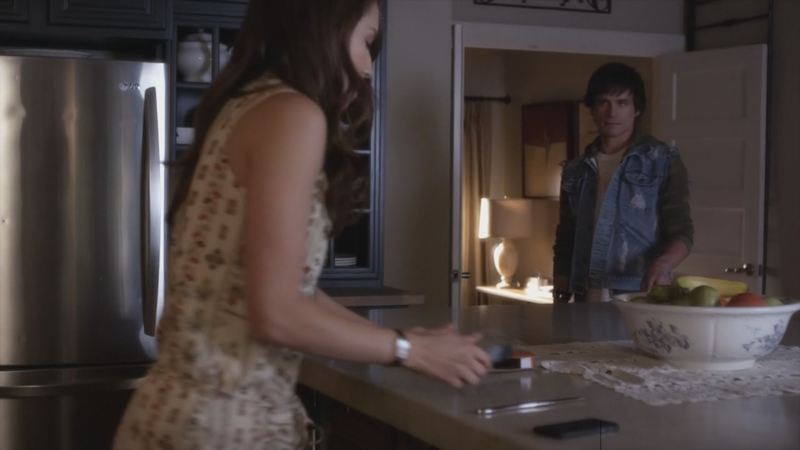 Best Moment: Mike watches Spencer from outside her house (Also Mike opens his bedroom door and boom, guns are out). 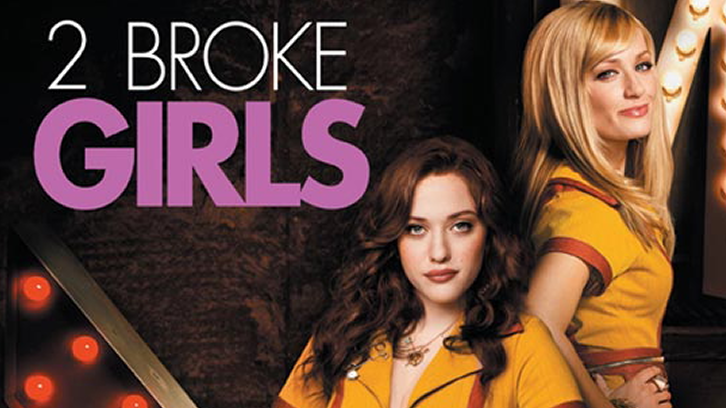 Saddest Moment: Hanna realises her father won't help her with her college funds. She tells Ezra that she wishes he would have said she knew she could do it. Creepiest Moment: End A scene with him dripping Hanna's blood on Mona's bloody shirt. Biggest Reveal: Talia is married?! What?! Best Cat Fight: Hanna vs. Tom Marin. Wasn't really a cat fight but Hanna showed her father he should be proud but he chooses his wife's daughter over his own. Not really a clear winner in this fight but Hanna wins alone for her sass. What did you guys think of 'Out, Damned Spot'? Let me know in the comments and be sure to watch the next new episode of Pretty Little Liars on February 17th on ABC Family!